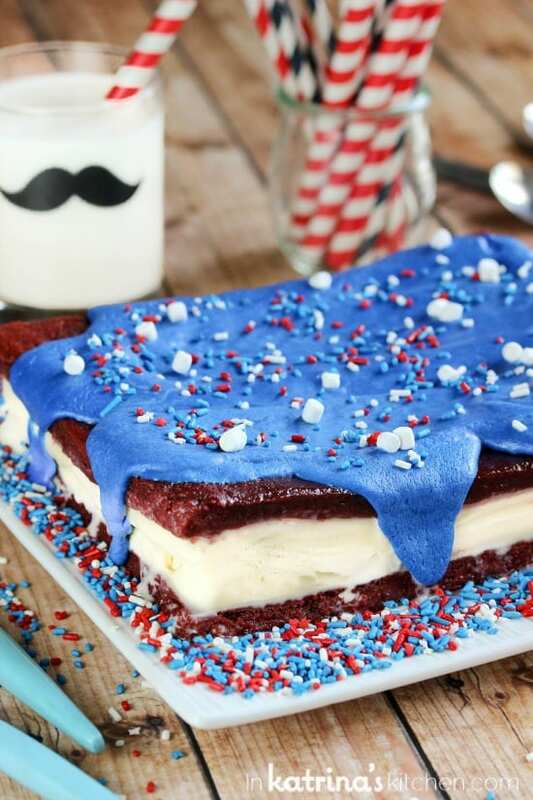 Festive and patriotic dessert- learn how to make this Red Velvet Brownie Ice Cream Cake. It’s easy, and delicious! Sometimes don’t you just want to eat ALL THE ICE CREAM? I am not normally and ice cream person. When I was pregnant with both of my boys I craved popsicles, slushies, and smoothies. The saddest part of it all was that I had a built-in, living excuse to eat all the ice cream I wanted and there are 2 creameries within a few minutes walk From my house. But I was young and stupid so I passed up the ice cream cones for popsicles and the milkshakes for all fruit smoothies. I mean- who doesn’t eat ice cream when they are pregnant? Well, we’ve fixed that. Only I’m not pregnant, but I still can walk down my street and have my choice of 2 local creameries within 5 minutes of deciding if I want a double or triple scoop. Also, I’m all about the brownies and milk these days. Do you guys love a big glass of icy cold milk with your brownies? And since these brownies were frozen it just made the cold milk even more refreshing. It was like eating a giant Oreo straight from the freezer. 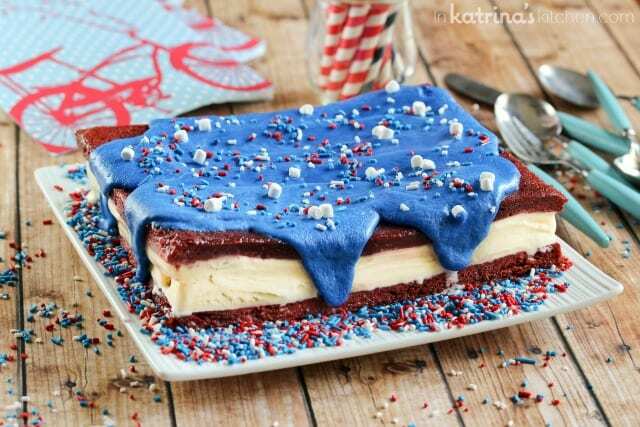 Festive and patriotic dessert- learn how to make this Red Velvet Brownie Ice Cream Cake. It's quick, easy, and delicious! Preheat oven to 350°F. Empty brownie mix into large bowl. Add sour cream, eggs and red food color; mix well. Spoon batter into greased foil-lined 9x5-inch loaf pan. Bake 55 to 60 minutes or until toothpick inserted into center comes out with fudgy crumbs. Cool brownie in pan 10 minutes. Remove from pan; cool completely on wire rack. Gently stir whipped topping, lemon extract, 1 teaspoon neon blue and 5 drops neon purple food colors with spatula until evenly tinted. Stir in 3/4 cup of the marshmallows. Set aside. Line loaf pan with foil with ends of foil extending over sides of pan. Cut brownie in half horizontally into 2 layers. Place bottom brownie layer in loaf pan. Gently spread ice cream over brownie layer. Place top brownie layer over ice cream. Spread whipped topping mixture over top. Press remaining 1/4 cup marshmallows into whipped topping. Cover carefully with foil. Freeze at least 2 hours or until firm. Use foil handles to remove dessert from pan. Place on cutting board; let stand 10 minutes to soften. Cut into slices to serve. I have given you the recipe as written on the McCormick website. I made these changes: swapped out 1 cup vanilla buttercream frosting for the whipped topping (colored as instructed), baked in a 9x13 pan using boxed mix suggested baking time, and I added sprinkles with the mini marshmallows. whoa, incredible! I want the whole thing! This is all sorts of awesomeness!!!! 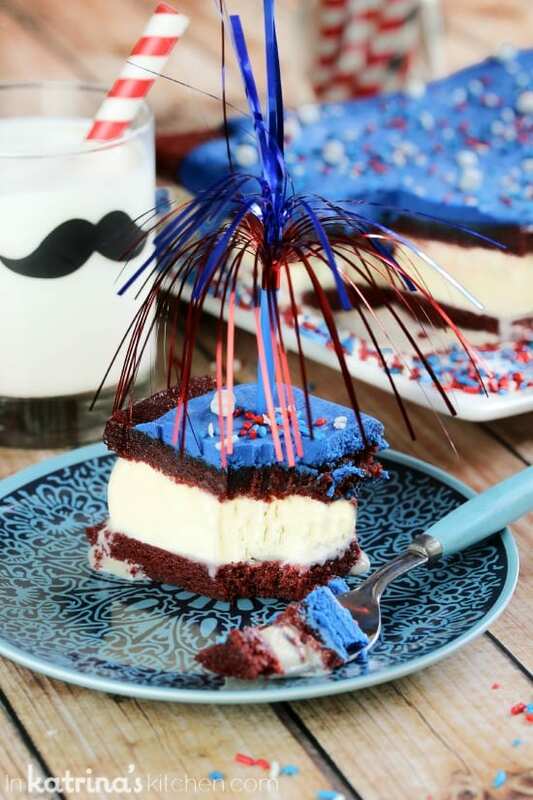 I totally love the red, white, and blue action going on in this fun cake! LOVE this ice cream cake! So festive! Pinned! Thank you for pinning Anna! Wow, these are gorgeous girl! These look so good! Have to admit, I love ice cream. And I did eat a lot of it when I was pregnant! What a great 4th recipe. It looks pretty AND sounds amazing. Ha! Thanks for stopping by. Ice cram and pregnancy just go together! What a festive cake! It looks amazing! Thank you! I love getting my boys involved in the kitchen and they really enjoyed making this with me. Yes, I want to eat all the ice cream. I’m a huge fan of ice cream, especially when it’s so dang hot and humid outside. This looks wonderful! Yes let’s eat all the ice cream 😉 Thanks Jennie! question can the box mix for the brownies be substituted for a homemade recipe??? You can use your favorite homemade red velvet brownie recipe of course!